There are probably some explanations that would be fitting. A back story of sorts might help dear readers to understand my predicament. My blog title is Hoe and Shovel. Okay, that isn't news. Given the name, though, you might think I am a grand proponent of the tools used in my blog name or maybe you think me a collector of them or maybe even that I am a ... oh my... is it possible anyone thinks 'that' when they read my blog title? I can't bear to think of it. I DO love my 'shovel' and definitely couldn't live without it. My shovel could really be considered an all-in-one tool being that I use it for almost every project. That and my hand trowel. But truth be told Hoe and Shovel is not the owner of one single helpful hoe. So the back story is simply that my (adult) daughter thought I should start a blog (almost a year ago). So much so that she created my blog template initially, called me on the phone as she was setting it up and asked me what I would like to name it. One of the first names I thought of(shooting from the hip) was Hoe and Shovel... simply because I thought it sounded like a cool blog name for a passionate gardener. I admit I wasn't really taking it seriously that I would ever really blog... I barely knew what a blog was at the time. That's how we got the name... it was later to be learned there was a whole world of garden bloggers out there ... but that's a post for another day. When I think of how much has been accomplished with so few hand-tools at Hoe and Shovel it is kind of remarkable and even surprising on some level. 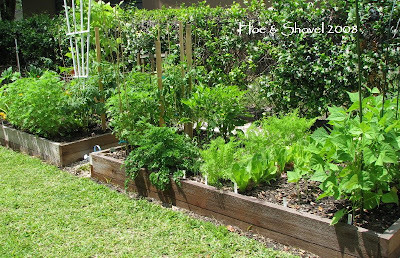 Normally I wouldn't even give it a thought but all this talk of hoes and hoe downs over at May Dreams Gardens and so many other bloggers joining in got me started contemplating my lack of long-handled implements. Wow, now Carol gets some serious work done with the help of all her hoes. Not only that but some of them are such attractive hoes that it should make everyone think they need at least one or two hoes hanging around for good measure. All along I had resigned myself to the idea that I wouldn't participate in this particular fun project in terms of posting. After all, it would be kind of shameful for a blogger with the blog title Hoe & Shovel to come clean about not having any hoe experience to share at a hoe down. Of course, I wanted to read everyone else's hoe down post. "#5. Different hoes work in different ways. ...Every gardener works in different ways, too. You can watch how other gardeners work, but for many gardening tasks there is no right way or wrong way. You should find your own best way to work in the garden, to get your best results." 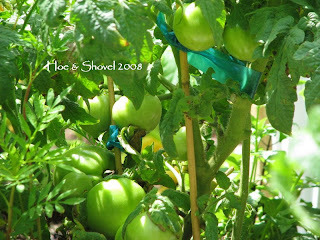 Here's the Part Where You Might Wonder Which Is The Sharpest Hoe in the Garden? This week I was helping my toddler grandson understand how to use some kid-sized John Deere tools I recently bought for him. I was showing him how his circle hoe loosens the dirt or moves the leaves out of the way so he can dig properly. These two mini-tools are actually quite handy (and well made too). Being that adult look-alikes have never been used around here before ... at this point I'm having a bit of a dawning in my thoughts about this. I've kind of always been guilty of getting by with less-than-great tools. A side note: That doesn't include my power tools which ARE great... the mowers, the edger, the blower, the trimmer... those really have to be up to par in my opinion. But for some reason I tend to use few hand tools ... sort of making the ones I do use work double duty and overtime. I'm not sure why this is but all this talk of tools has certainly got me being introspective about my methods. It happened to be time to fertilize the veggie garden today. Usually it's my trowel that breaks up the soil for blending in the nutrients. With this new dawning I was experiencing, it was decided to use the kid-sized circle hoe and the kid-sized hand rake-- the kid was no where around. Just the gardener using the kid's toys. Later in the day they also came in handy when adding fertilizer to all my potted containers and for moving the leaves out of the way under the impatiens for an application of Osmocote. So here's the low down .... errr, I mean hoe down. The infamous (above photo) 'do almost everything' shovel, the trowel that gets used for everything else..... and I allowed the mini hoe & rake in another photo since they've proven so handy this week. Lastly, since rakes were allowed in the hoe down the above photo displays the only other well-worn (and very old) long handled tools I use for all the garden projects here at Hoe & Shovel. 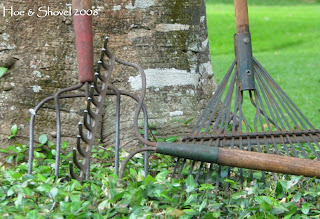 Rake & Shovel just doesn't sound as good as Hoe & Shovel. So... here's what I'm thinking ... the Hoe gets to stay. What do you think? First off...I think your little garden helper is adorable! Interesting how you bought good tools for him...we sometimes feel like it's ok to give gifts but not buy for ourselves...hmmm...I'm guilty of that too! I confess I have a few tools I use for everything too. Lastly...yes...the hoe can stay...maybe you'll find the one meant for you and become a hoe convert! Leslie: Thank you -- he's a lot of fun and ALL boy... loves the dirt, rocks, leaves, water.. you name it. It is very possible I could become a hoe convert after reading all the wonderful posts about their uses. Absolutely you have to stay as Hoe and Shovel, but you really should find a good hoe to get, especially since you have your raised bed vegetable garden. You should read all the Hoe Down posts, and then decide. Out there somewhere is a hoe waiting to become THE hoe that makes Hoe and Shovel 'complete'. Please, don't change your name! We won't be able to find you. Here's an idea, buy a good hoe just to justify yourself. I don't use a hoe either, but with all of my talk about the hoedown, my husband took up one of the antique ones to get some dandelions out of the garden for me, and he had a ball. He said why didn't we do this before? Carol brought our secret out. Most of us prefer to go hoeless. 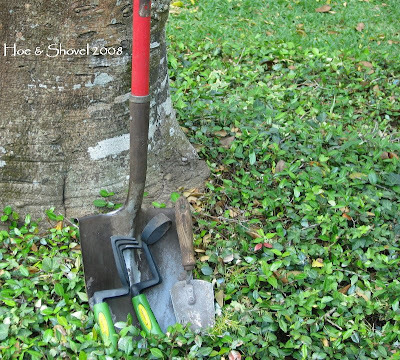 Hoe and Shovel seems such an appropriate name for your blog and I love your story of how it came about. You never know, one of these years someone might buy you a hoe as a gift. Or, maybe, now that you have used the little hoe you just might buy one for yourself. I love the little set of garden tools and will have to find some for my grandson and start him on the road to being a gardener. What a catchy title for your post! I'm so glad Carol invited alternate tools to the Hoe Down. I think tools meant for children sometimes work better than full-size adult tools - I have a small garden rake that's perfect for clearing leaves under low-growing shrubs. I think it so funny that you don't use a hoe and your blog name makes one think that it is a tool of choice. Ha... You absolutely should not change the name of your blog. It is wonderful. 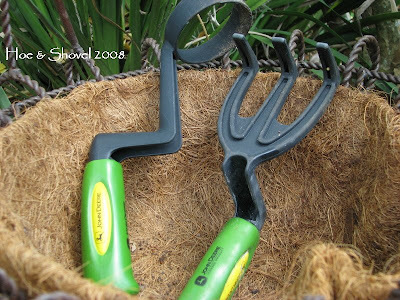 As to using childrens toys, I have a childs garden rake that I use often around the perrinials. It is great. I felt funny purchasing it for myself. Of course no one else knew what I was going to do with it they just thought I was a wonderful adult purchasing a toy tool for some child. ha..
Meems, your blog's name is clever whether you go hoeless or not! Like you, I use very few manual garden tools, and a few power tools. I wouldn't be without a blower with all the messy maple debris we have. The buds have all dropped, next it will be the helicopters, and of course leaves here and there all summer, then the deluge in the fall. I have lots of stuff I don't use, but always go back to my basic tools - shovel, spade, hand trowel, a variety of pruners, and lots of different gloves for my favorite tools - my hands. So much gets down with so few tools...that is how it is done at Clay and Limestone...A Transplant Spade, a few hand tools, a rake, gloves, a garden cart and hoses. Those rakes and pitch fork have been around for a very long time. I think I rubbed a few blisters on those handles many moons ago. The garden is looking great by the way. Carol: I think you're right - I have taken some pretty good notes from all the other hoes at the hoe down and I might have to buy one ... maybe Mother's Day a hoe will show up. jane marie: I never knew how handy they could be... I have determined I will need to try one out in the near future. Crafty: those shorter handled tools I'm seeing on other blogs do seem like something I'd get lots of use out of ... that might be the way to go. Hope yours have rested up from the rainy days and are ready to get to work. entangled: Thanks. Who would have known those miniature tools would work so well? It's a good thing the rakes weren't left out of the party or might have had to stay home all together. Lisa: Well the secret is out now about both of us playing with the kids toys. I bet your rake is just right for those particular jobs. Linda: We are grateful for the blower around here as well... so many trees... so many leaves. Basic is my mantra... but I might be adding a hoe to the mix after so many showed up at the hoe down. Gail: you know, you just get used to what works for you don't you? I really liked your short handled shovel. My neighbor has one similar she let me use to dig up some of her plants she was passing along to me... it was really a nice size. I'm gonna be on the look out for one of those. Nathan Talbot: I'm quite certain you and your brother may have roughed your man-hands up a bit with these tools. If I remember correctly the pitch fork was purchased initially to get rid of rabbit poo under their cages. Now it comes in handy for turning my compost and moving large piles of cuttings. All those tools were gotten at the Ace Hardware down the street that has been long gone with the opening of the big box stores. I used to love that store. shady gardener: My shovel should get an award for all the varied chores it has helped with... but nothing beats hands and knees where most of the work gets done! I've had similar thoughts as you about the aptness of the title of my blog. Purists will probably say the content doesn't say too much about veg. However I spend oodles of time up at my plot and it seems to be the place where I get problems, life etc sorted out - so I think that makes the word plotting much more meaningful than using the word plot. Besides - people seem to remember the name as we all do with Hoe and Shovel. 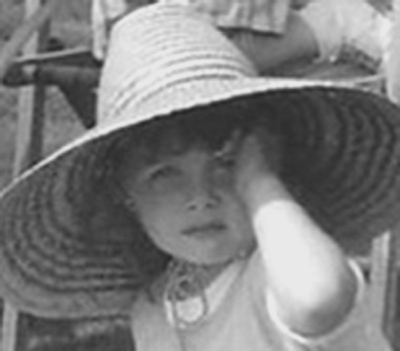 Thanks for popping on over to my blog too! I'm with Carol! Keep the great blog name and commit to a great hoe. We all have our favorites and mine is the scuffle/stirrup hoe. Once you have this hoe you will use it often! I want one of those helpers! vp: it does appear I closed to being a hoe convert... I do feel I've been missing out on something on these years after reading all the great posts and seeing all the wonderful implements. Plotting is a good word... we do solve many of life's troubles in the garden... it is truly a wonderful sorting out place. Thanks for visiting. In the meantime me and my helper will share his tools. I'd keep the name too, it sounds very nice. I own a hoe, but rarely ever use it. I usually choose to use a shovel instead as well. OH, the title of this post made me laugh! You certainly aren't...well...you know :) I love the title of your blog, so fitting for a garden blog even if you don't use a hoe. I suppose if I based my blog title on tools it would be "Pick Axe and Garden Fork", lol! I'll tell you that while I was preparing my beds that there were many *many* times that I wished I had a hoe. I eventually prevailed without albeit with considerable amounts of extra effort. You're my favorite garden hoe of all, though. Take that statement however you will~ it's because your blog name to be both poetic and cheeky that it's so great. 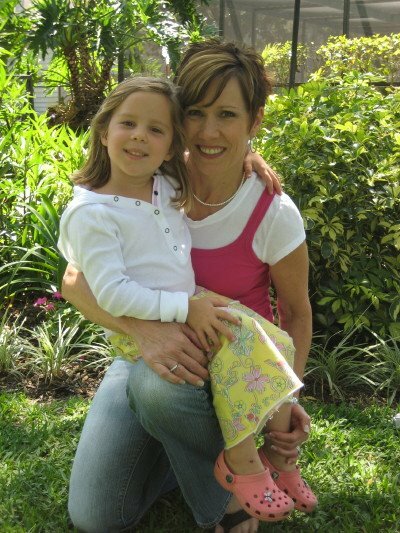 And the grandson (it's difficult for me to believe that you're a grandmother!) is freaking adorable! I can't wait to have kids myself so I can set them loose in my yard with miniature garden tools and baseball caps. This is hysterical and I must admit, just a bit shocking!!! You are the best "blogger" I know! Always beautiful and fun to read! cinj: Your vote is counted... the name stays the same... I do think the hoes are gaining popularity even though the shovels have long been good stand ins. Amy: you always bring a smile to my face. Pick axe ... sounds so... well... unromantic.Then again I guess all gardening isn't bliss is it? Favorite garden hoe huh? Too funny. With all the work you did to dig your garden you definitely could have used some good working hoes. I bet you've gained some good muscles with all your tilling of the ground! p: Thanks...thought you'd appreciate this one. You turned Confession Time into a fun post, Meems - your blog name is cool and the title of this post may get you some weird google hits! I don't think gardening in my part of Austin would be possible without my hand hoes...it surprises me how you can have such a wonderful garden with so few tools. Maybe your soil is lighter and sandier so you can get out weeds with a trowel? To weed my black clay I need a steel fingernail, the definition of a hand hoe. You might be happy to know I've just ordered my first hoe... I took my cues from Carol (I like to follow proven folks) and ordered the circle hoe. 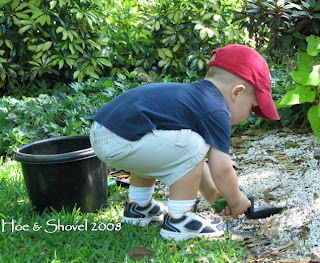 After using my grandson's toy circle hoe I was convinced it was a tool I could make lots of use from in the garden. I don't have clay here and I never let my weeds get too big so maybe that's why I haven't needed a hoe... not sure. Then again it may be one of those things I find out I wish I had had all along... you know how that is!